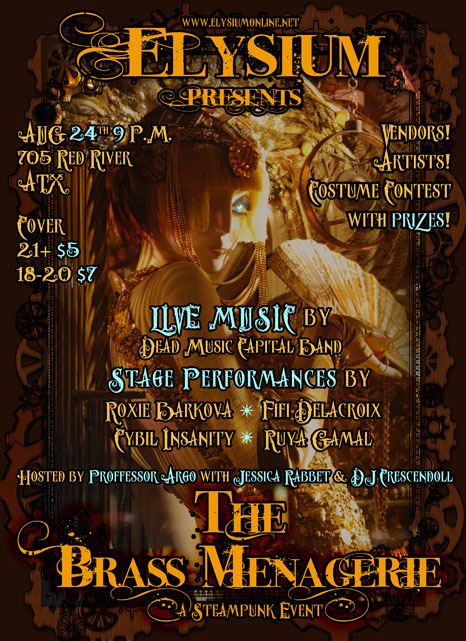 Elysium presents The Brass Menagerie: A Steampunk Event! whip our your bustle and hit the town for your local steampunk event! Get ready to feast your eyes and ears on some of the finest music and dancing the steampunk community has to offer! We have Live Music by Dead Music Capital Band and Performances from Roxie Barkova, Fifi Delacroix, and Cybil Insanity! And don't forget to bring your dancing spats!Hosting DJs will be Proffessor Argo, Jessica Rabbet and DJ Crescendoll! Wear your best! Photographer Jeff Cicoliani will be snapping photos at his booth and around the event and there will be a costume contest with prizes later in the evening! Vendors and Artists will be offering their fine wares, so bring your coin purse and be prepared to be tempted! Sky D.O.G.s , The Brass Apple, Caveat Emptor, Turner's Tokens, Shrek's Leathers and more to come!